Paleo Gingerbread Cookies | give the gift of paleo christmas treats. Christmas shopping is stressful, right? The crowds, the parking, the dollars spent + the biggest stress of all is ‘picking the perfect present’! Well, first things first, here’s a gift for you, our paleo gingerbread cookie recipe! Scroll down if you just can’t wait any longer! This year, we’ve decided to take a minimalist approach to Christmas + instead of focussing on the gifts, we are focussing on quality time with family + friends. Don’t get us wrong… we still LOVE to give gifts but instead of hitting the shops, we are whipping up a batch of paleo gingerbread cookies, packaging them up + tying them with ribbon! CUTE! Edible gifts are the best kind of gifts… + when they are healthy too, it’s all a big WIN WIN situation! Here’s a few of our ideas to make your Christmas presents unique , delicious (+ merrymaker approved!). paleo raw choc peppermint bites. These raw choc peppermint bites are inspired by the candycane but with added CHOCOLATE! Which means added delish factor! We like to make a batch, put them in a cute jar + tie with ribbon! A little mini blackboard adds to the cuteness too! Our paleo coconut ice is super sweet + pretty, it’s actually REALLY healthy too! We like to place a batch on a nice wooden board or platter + wrap in cellophane! You could also place some in cellophane bags or a cute box! For your savoury queen or king! These spiced nuts are SO delicious… yes TOO delicious (you might want to double the batch!). We used pistachios, pumpkin seeds + cashews for the gift below! We’ve been gifting loads of granola to friends + they just LOVE it! Make a batch + place in a cute jar or cellophane bag! We have heaps of recipes, so take your pick: banana cereal clusters, orange + date granola, chocolate granola or just your regular granola. Cake on Christmas is always necessary but we’re not fans of traditional Chrissy pudding. Instead? We will be making our paleo raw Christmas cake (think chocolate, vanilla + citrus-sy flavours… YUM!). Make this cake when someone asks you to ‘bring the dessert!’. Trust us, you will be the talk of the party! Now for the crowd pleaser! 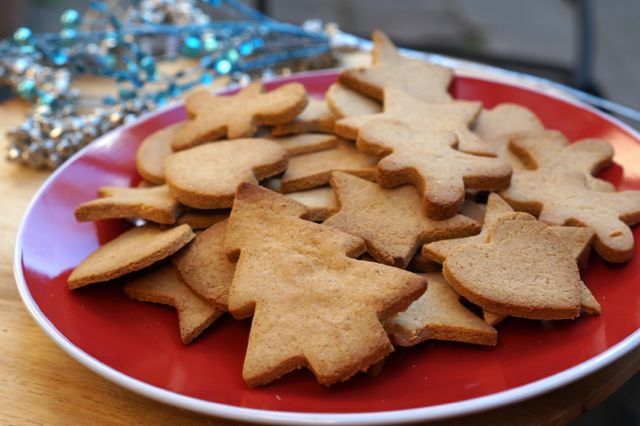 Paleo gingerbread cookies! Yes, we said PALEO GINGERBREAD COOKIES! This recipe is all thanks to merrymaker mum (she really is getting good at this!). Bake a batch, package them up + write a cute Christmas note to all your friends + family! We LOVE paleo gingerbread cookies + you will too! Do you have any more ideas for healthy edible chrissy gifts? We’d love to hear them, just leave us a comment! In a large bowl mix the almond meal, cinnamon, ginger, nutmeg, baking powder. Leave this for now. In a food processor, whiz the coconut oil, raw honey, vanilla extract + egg until combined. Add the dry ingredients to the food processor + whiz to form a dough (the mixture will be quite moist). Take out the mixture + knead a little to form a ball. Place the mixture between 2 pieces of baking paper + roll out to 3mm thick. Place this into the refrigerator for 30 minutes. Once refrigerated, cookie-cut into desired shapes (like gingerbread men, stars + chrissy trees!) + place carefully onto a lined baking tray (you will need 2 trays). Place into the preheated oven + bake for 25 minutes or until golden brown. Allow to cool + enjoy! Watch the oven especially if your cookies are super thin. They will cook faster!